"Century 25: Love in the Time of Apocalypse"
Lara Wayne demands to know why Ator, a member of the Green Lantern Corps, will not discuss his feelings for her. Another GL, Va'An, tells her that this is not the time, but Lara will not hear of it. Ator tries to explain, but when he mentions that Lara is but a child Lara becomes incensed telling him that she is no child since she was born in the 21st Century. Another GL points out that she should try to understand that even though Ator is fifty cycles, by the standard of his race he is but a teenager. Lara makes a final plea for Ator to admit his true feelings. Ator says yes though he adds a "but", which upsets Lara enough for her to vow that if age is such an issue she will have to do something about it. Meanwhile, Lois Wayne and her father fly to the planet Mars. The two discuss how the man they are going to visit has kept from going mad, which leads them to talk about Superman. Lois' father changes the subject quickly and the two are greeted by J'onn J'onnz, the former Martian Manhunter. After some pleasantries J'onn explains not only why he summoned them but also why he didn't make the trip to Earth himself. J'onn tells them that while Martians life is long his time is now short and his only source of strength is the depleting energy from the planet Mars. He also tells them that while his mental powers are fading they are still strong enough to detect disturbances on the psychic plane and that for a century now he has become increasingly aware of such a disturbance. In Metropolis a group of men, led by a man named Garrett, search through ruins to find the remains of Lex Luthor. They come upon the spot where Garrett believes Luthor is when suddenly Luthor breaks free. He cries out at his freedom and rages at how he had been double crossed. He continues by saying that his captivity is over and that the whole world will pay for his pain. In Gotham City Lara flies to Wayne Manor to search for Batman, who for the past forty years has gone back to his urban myth status after Wonder Woman went back to Themyscira. She sets off one of the security measures, but instead of falling through a sophisticated trap door she hovers before deciding to investigate where the trap leads. In the depths of space on a massive space station the remains of Darkseid's elite guard argue amongst themselves. Granny Goodness in particular is raging as she demands to know how much longer the incubation period, which has gone on for centuries, is going to take. Desaad tells Granny that for a god she is surprisingly impatient. Vundabar concurs with Granny adding that he suspects duplicity in these constant delays. Desaad grows angry at the accusations and points out that everything ha played out exactly as he planned and that not only did he dispose of the New Gods but he got rid of Superman as well. While Kanto does his best to down play Desaad's achievements Vundabar decides to take matters into his own hands and activates the incubation pod. While Desaad cries out that Vundabar is a fool leading Vundabar activates the machine to give life to the lord of Apokolips. A flaming creature emerges and Desaad cries out as it approaches. Back on Earth Lara thanks her Grandpa Bruce for helping her as they fly across the ocean. They reach their destination and Lara flies into the ocean. As she flies to her destination she muses on how Batman may not have helped her if he had any idea why she wanted to know where the Gold Kryptonite was. Finally she finds the Gold K and flies back to Batman's jet. Batman finally demands to know why she wanted it and before he can stop her she opens the box and exposes herself to the Gold Kryptonite, changing her life forever. Meanwhile, in Metropolis, Lex Luthor (a.k.a the Ultra-Humanite) has invaded the Superman Museum. Two Green Lanterns appear on the scene to back up the police, but are quickly defeated by Luthor, who has used the exhibits to his own evil ends. Luthor quickly dispatches one of the Lanterns leaving the other one questioning how he was able to do it. Luthor explains that his weapons allow him to fire energies on a constantly, oscillating frequencies. Back at the Green Lanterns Citadel Va'An argues that Ator could have handled the situation better. Before the argument could continue they are summoned to Metropolis. As they arrive on the scene Va'An is immediately struck down. On Mars Lois and her father hear the Green Lantern Emergency Beacon. The two fly off with Lois telling her father to go ahead since he is faster than she is. Back in Metropolis Ator and Xuum assess the situation with five dead at the hands of Lex Luthor. Ator sees an opening and takes it, stopping the robot. Xuum congratulates Ator, but Ator is quick to point out that Luthor's brain is not inside the robot. The disembodied voice of Luthor agrees telling them that he uploaded his intellect into the A.I. systems that run the museum. Ator tries to escape Luthor tells him the game is over and that he has left Ator a special prize. Suddenly Ator comes across an atomic bomb. The bomb detonates and Ator manages to capture the explosion with his ring. Batman's jet lands and Lara and Batman run to see what happened. Lara is very upset when she learns that not only was a Green Lantern involved but that it was Ator. She is brought to the communication screen where the police have been in communication with Ator who is relived to see Lara. He tells her to fly through shielding to get him. Lara's world crumbles around her as the full realization of her decision to get rid of her powers sinks in. Batman is aware of it too and asks how long Ator has, planning to fly to the Fortress of Solitude to obtain the cure for Gold K exposure. One of the officers tells him that Ator has two to three minutes at most. Lara surges forward to save Ator, but Batman stops her. One of the officers asks why since she is as powerful as Superman. Batman tells them that she isn't anymore as Lara begins to break down emotionally. Batman holds her, telling her that she can't do anything now. A female officer informs them that no one can do anything anymore because they just lost contact. Ator is dead. Story - 4: Was it me or did the reading of this issue go quicker since all of the ads were in the back of the book? O'Henry, irony, '50s romance comics and, ultimately, depression. Those were my first impressions of issue six of Superman & Batman: Generations III. I'll take the '50s Romance Comics part first. From the first page to the last panel this book didn't feel like a super-hero tale, but an old romance book. A few years back I picked up a collection of romance books in my local library and read the thing cover to cover. I learned a lot that day mostly that you shouldn't read a collection of romance comics in one sitting because frankly, after a while, they all meld together into one story. I mean they were enjoyable and all, but unlike horror books (which one can read for three days straight without losing their charm) less is really more. 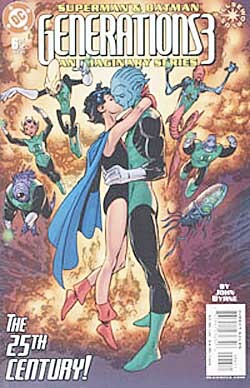 At any rate, this issue's main plot was paced liked a romance comic. From the very beginning with Lara demanding to know why Ator won't reveal his true feelings to her quest to win his love to the end where she realizes that she can't save the man she loves the whole story had a romance vibe. Even the title of the story was something out of that era. Overall I think Byrne really nailed the vibe in terms of dialogue and inner monologues. The great thing about those comics is the fact that you don't need a whole lot of characterization because it was the plot that drove the story. Not that there wasn't any characterization, at least on Lara's part. Ator on the other hand was the male lead of a romance book with a Green Lantern ring. I liked it. It gelled nicely together. This leads to O'Henry and irony. O'Henry wrote the wonderful short story The Gift of the Magi, which was a wonderful story about a young couple who through a funny set of circumstances sell an item (in the man's case a pocket watch) or body part (in the woman's case her hair) to buy the other a nice set of combs and a chain for the pocket watch. (If I got that wrong I apologize, it's been a while since I read the story.) Now I realize that this issue doesn't follow that exactly, but there is an ironic, almost Twilight Zone feeling to this story. Lara gives up her powers for Ator only to watch Ator die because she couldn't save him. It was twisted and depressing. Twisted as it sounds the depressing nature of this issue really worked for me. Call me crazy but I think that wrapped in the simplicity of a romance tale was a heart wrenching story that took the character of Lara a step further. On the surface Lara's action seem kind of thin character wise, but when Ator died and the full ramifications of her actions took hold you could see that something inside of her changed. It also brings up some interesting questions, like how will her father and sister's late arrival affect her relationship with them. If they had been there they could have saved Ator. In the end though the fault would have been Lara's and Lara's alone. There were other little nuggets of goodness spread throughout the issue. The little bit a foreshadowing involving J'onn J'onnz was great. I liked the New Gods sub-plot and am curious if that is Darkseid that came out of the pit. Also, the return of Lex Luthor was very well done and brought out the grim nature of the Green Lantern Corps. On one hand they have the most powerful weapon in the universe. On the other hand with the right weapons they can be wiped out. The GL's were treated as soldiers and I liked that presentation. I would have liked to hear more about what happened between Batman and Wonder Woman, but there's a lot I would like to know more about involving this series. I enjoyed the reference to Batman going back to his "urban legend" routine, which was a nice reference to the current portrayal of the character. Also, and finally, the man searching for Luthor was named Garrett. He seemed to be an archeologist. If I'm right this was a nice little nod to the Dan Garrett, who was an archeologist and the super-hero known as Blue Beetle. Just a thought. Overall I enjoyed this issue. Not as much as the previous one, but still it was a solid effort. Art - 4: I would like to take this moment to rectify a perceived mistake I made in my previous review, specifically the admonishment I made regarding Byrne's crooked smiling Batman. I was looking though some old Batman comics and I realized that this was how Batman was in the Silver Age. He smiled. A lot. During the seventies that he stopped smiling and wouldn't shut up (until Frank Miller got a hold of the character), but before that he smiled a crooked smile (crooked as in the teeth didn't line up with the mouth, not the shape of the smile itself). So I apologize because I should have kept my big mouth shut. The artwork was pretty solid this issue. The New Gods sequence seemed a little rushed and sketchy, but the Green Lantern sequences were fun and well paced. The scenes on Mars were a lot of fun as well. The true highlights were the first and last page. Lara's expression as she demanded to know how Ator felt was pretty striking. The last page, though, was very powerful. The expressions were dead on and the pacing of the page worked well to invoke the mood of the piece. The breaking up of the last two panels was great and both depressed and impressed me, if that makes any sense. Overall I liked the artwork. The New Gods sequence was a little weak, but the rest of the issue more than made up for it. Cover Art - 5: Great cover. The framing of the characters around Lara and Ator was really striking and had a serious "grab me" look to it. The covers continue to improve and this was definitely in the top two of the series so far.